Pocketbook has been making e-readers consistently since 2007 and the company has a number of great devices coming out this year. The Pocketbook Ultra and Aqua are very unique and distinguish themselves quite nicely in a crowded marketplace. Pocketbook has unveiled a new e-Reader today called the InkPad and it seeks to provide more screen area to read on with its giant eight inch display. 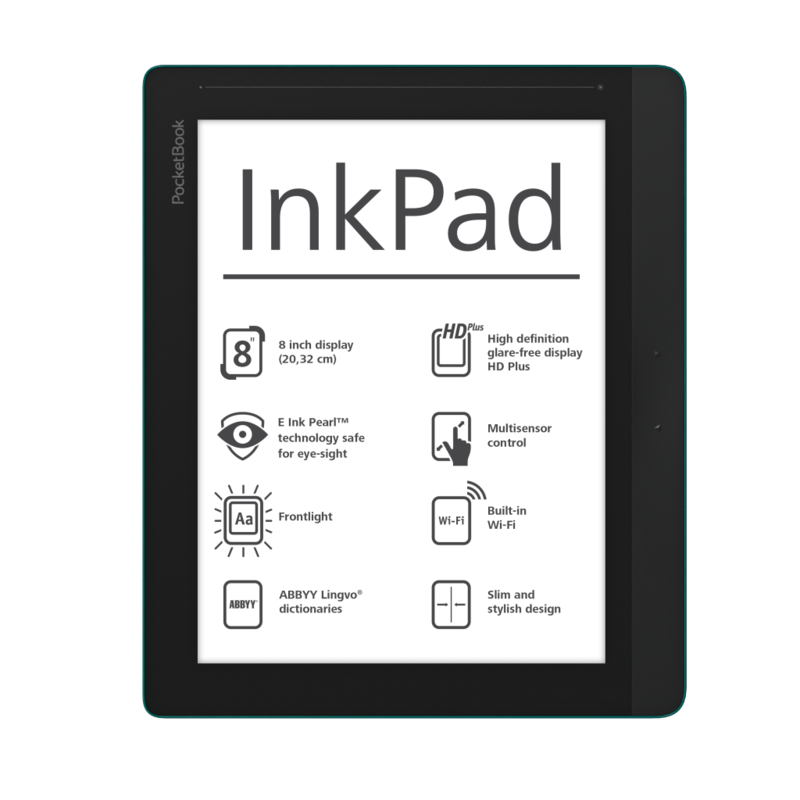 The PocketBook InkPad screen is based on E Ink Pearl technology and has the highest screen resolution for such devices – 1600×1200 pixels. High resolution allows you to adjust the font size from the minimum to the maximum without losing definition. Exceptional image clarity will provide a special comfort of reading and the ability of E Ink screens to use only reflected light will make reading perfectly safe for eyes. Most e-Readers these days have an illuminated display to assist in devouring books in low light conditions. It has a special sensory area located above the screen, which eliminates the need to use the on-screen menu. A powerful 1GHz CPU and 512MB of RAM provide smooth pages turning and stable use of any application. 4 GB of internal memory expandable up to 32 GB will allow to collect a real library, which is always at your fingertips. It also has a 3.5mm headphone jack to listen to audiobooks or music. Pocketbook has integrated Text to Speech in this model, to have books read aloud. There is not many eight inch e-readers currently on the market. The only other new one to be announced this year was the Cybook Ocean, which is not out yet and dealing with FCC certification. There is no release date on the InkPad yet or price. can you make a review of this device? I am interested into comparision with Kobo H2O, reading of PDFs and quality of dictionary.